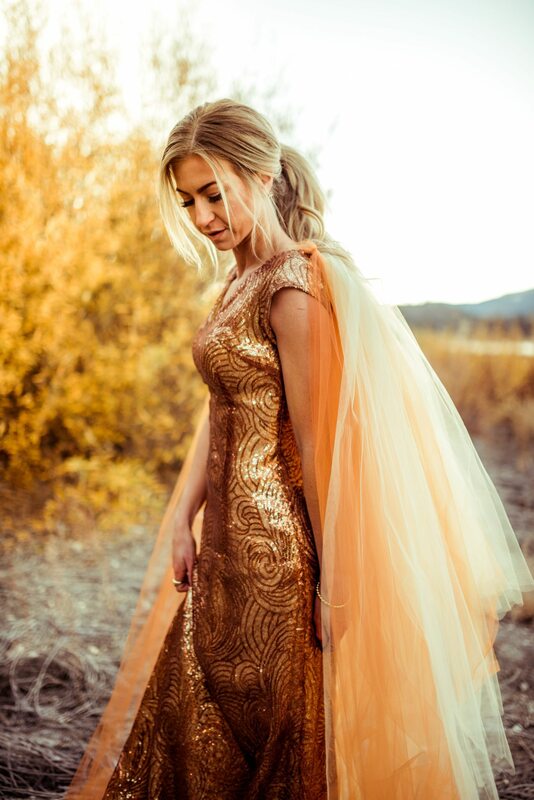 I wanted this dress to evoke the feeling of fall. I wanted it to capture the golden glow of the sunlight hitting orange and yellow fall leaves. There were a few different color pallets I could have gone with to incorporate changing leaves, but quickly settled on a light yellow that melted into a burnt sienna. The fabric for the gown is actually 2 different sequined fabrics on top of each other. I found a solid gold sequin color that I loved, but it was too yellow for what I wanted. I also found a darker rust see-through sequin fabric that was so close to what I wanted, but a bit too dark. I laid the darker fabric over the gold and it was PERFECT! 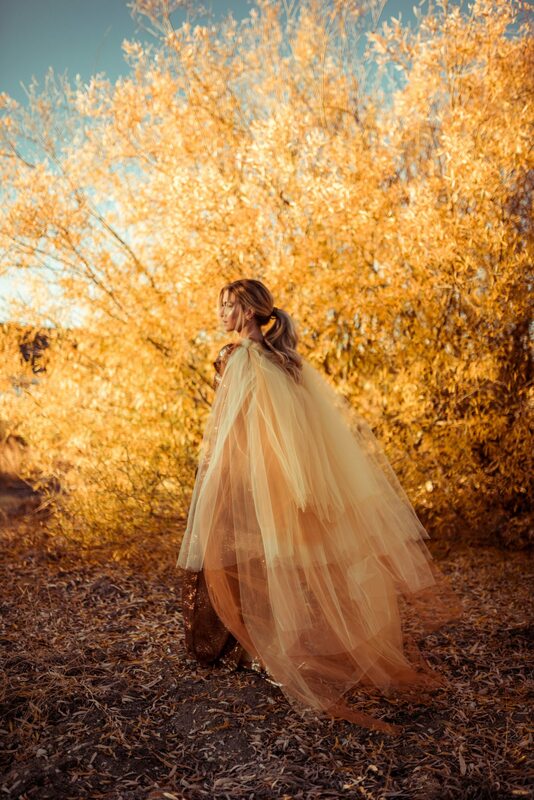 I bought 15 yards of tulle in various shades of yellow/orange and created an ombre effect for the cape, inspired by changing leaves. The more I worked on the dress the happier I was with how it was turning out. 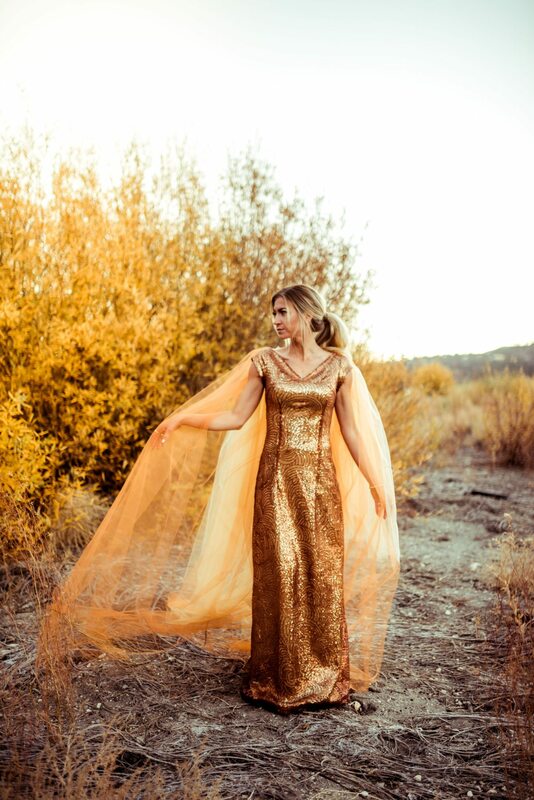 I ended up spending 13 hours creating this dress! But once I saw that my vision for it was working, I had to carry it out. I couldn’t skimp on the cape, so I ended up using all 15 yards. I needed that much for it to make a big impact. 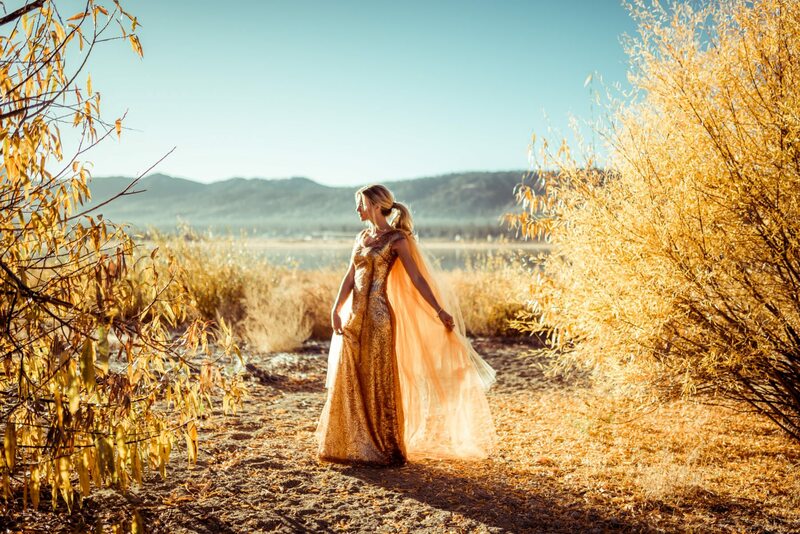 I knew I needed to shoot this dress in the fall leaves, so my photographer and I traveled to Big Bear lake in order to capture the full vision for this dress. We woke up at 5 am and got to the lake right before the sun rose. The setting for the dress was perfect! I have to tell you though- I have never been more cold in my entire life! There was frost all over the brush and about 15 minutes into our shoot my hands and feet were white! But as the sun rose and hit the dress, we knew it was worth the cold and early start time! By the time we were done shooting it was around 8 am and the sun was fully out. It was much warmer and when we checked the temperature then it was 35 degrees! So it had to have been close to 20 degrees when we first started shooting! If you haven’t seen The October Dress, and a full explanation of why I started The Monthly Dress series, you can see it all here. I already have my fabric for The December Dress, and can’t wait to get started! This is absolutely gorgeous! It perfectly captures the beauty of November. What an inspiration you are! I can’t wait to see each new month! You look like an actual goddess! Beautiful. Happy Thanksgiving! This is stunning! I love how it’s SO completely different fro the October dress and yet just as beautiful! I love seeing the process! Thank you for sharing that part with us too! Seriously so amazing. I can’t wait for the rest of the monthly dresses!!! Your dress turned out so beautiful! I saw in your Insta-stories how your layered the two fabric to get the color you wanted and I just love how it looks. 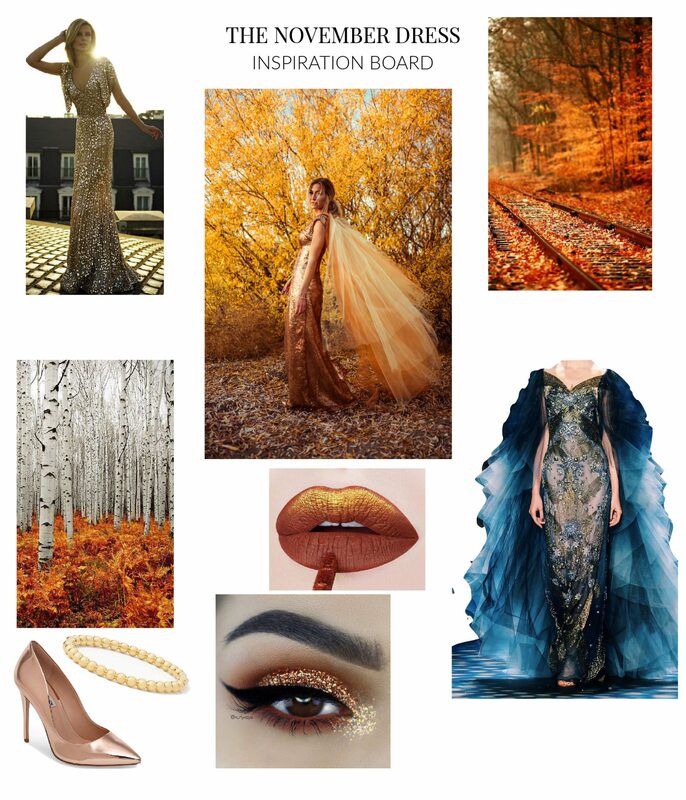 Thanks for also sharing your mood board. So inspiring! !